The American bullfrog is a warmth loving species that seems to be near the northern limits of its physiological tolerance in southern British Columbia. Consequently, it is the last amphibian species here to emerge from winter torpor and it will not reproduce until water temperatures are well above 20 degrees Celcius in mid-summer. Adults are carnivorous and cannibalistic, and feed ravenously. Each female produces 20,000 or more eggs in a season that hatch after a very few days. The tadpoles feed on filamentous algae, leafy vegetation, and settled organic material mostly in the warm shallows of lakes and ponds. 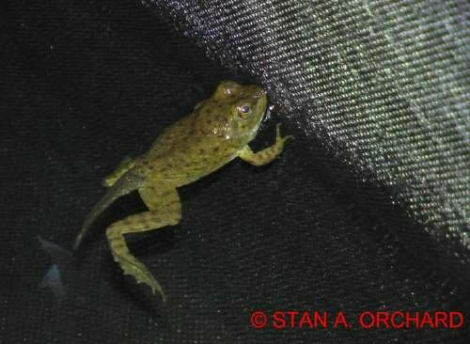 The tadpole stage varies locally and can take anywhere from one to possibly four years. Tadpoles transform (metamorphose) into juvenile frogs at summer’s end. Many of these will leave the home lake on warm rainy nights and head off overland to colonize new lakes and ponds. Because the aquatic tadpole stage is long, bullfrog populations can only become established in permanent water bodies - although temporary pools, ditches and ponds can act as way stations for transients. From mid-July through early August American bullfrogs deposit their eggs in vegetation along the margins of lakes and ponds. Each adult female will deposit as many as 20,000 or more eggs in a single jelly mass. If a site is being monitored rigorously it will be evident where reproduction is taking place because the males will have selected specific sites based upon the appropriate combination of vegetation to anchor and conceal the egg mass and a specific water temperature threshold of around 25 degrees Celsius or more. At most local lakes, reproduction will be concentrated at just a few spots along the lake margin. These sites should be selected consistently from year to year because the environmental factors that attract the bullfrogs to them will recurr annually - such as the character of the vegetation, sun exposure, water depth, and most importantly water temperature. 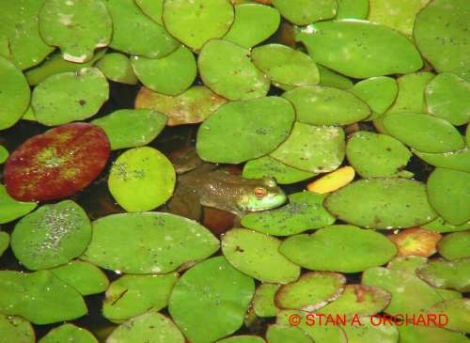 Bullfrog tadpoles hatch from their jelly envelopes in just a few days in late July or early August. They will then spend anywhere from two to possibly four years before they transform, or metamorphose, into frogs. They seem to have a longer larval stage in nutrient rich (eutrophic) lakes than in nutrient poor (oligotrophic) lakes. In the sun-warmed shallows of many local lakes and ponds bullfrog tadpoles gather and crowd to such an extent that the water boils as they scatter upon your approach. Though quick to flee from danger, the tadpoles are nevertheless armed with noxious chemicals in their skins that predators seem to find quite unpalatable. Consequently, with little mortality to predation, their numbers increase every rapidly. The tadpoles are vegetarian and feed ravenously. 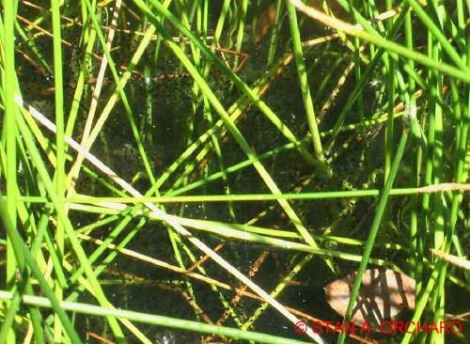 As their densities increase they tend to monopolize the primary production in lakes and ponds by devouring filamentous algae and leafy aquatic vegetation and converting it into bullfrog tissue. This is not good for sustaining species diversity locally because bullfrog tadpoles can competitively exclude other species who also require vegetation - particularly in nutrient poor lakes. 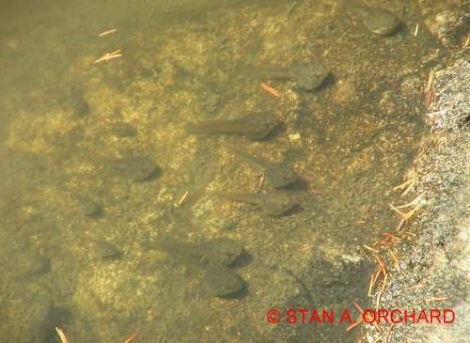 Tadpoles in the latter stages of metamorphosis congregate in sun-warmed locations around lake margins. 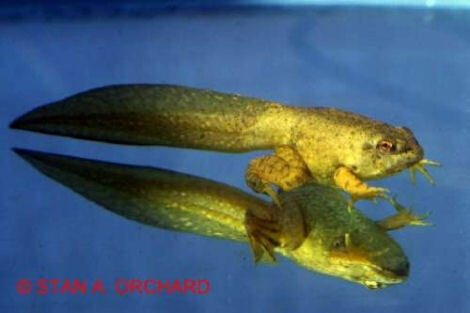 By July, it is not difficult to spot large tadpoles with four well-developed limbs and partially resorbed tails. By the end of the summer, metamorphosis will have fully transformed these tadpoles into juvenile frogs. Juvenile bullfrogs are particularly conspicuous because they make an emphatic and distinctive “MEEP” sound as they propel themselves, like fleeing grasshoppers, off of floating aquatic vegetation and into the water. These juvenile frogs are particularly prone to head off overland during warm rainy nights in the late summer and early fall. They are also an important food source for adult bullfrogs, who readily cannibalize them.